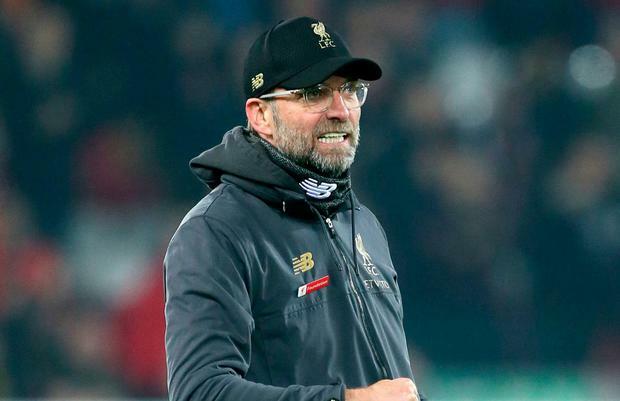 Liverpool manager Jurgen Klopp does not understand some of the scrutiny his team have come under in recent weeks but he was more than happy to answer their critics in resounding fashion. After four draws in five matches the Reds found their form in stunning style with a 5-0 victory at home to Watford - their biggest win since beating the same opponents by the same scoreline last March. It came at the ideal time as questions were being asked about whether Liverpool, particularly their all-star forward line, were running out of gas in the title race. Both two goals apiece from Sadio Mane and Vigil Van Dijk either side of Divock Origi's strike banished any talk of a crisis of creativity. "Tomorrow is another day: we have to deal with all the other things but that was fantastic football game and I'm really happy for the boys because they deserve it so much," said Klopp. "We draw against Bayern and against (Manchester) United and everybody talks about, I don't know exactly what they are talking about, but things I don't understand. "It's always about showing reactions but not reactions of the things we are talking about. "We wanted to play like this every day. That is maybe sometimes possible, sometimes a bit less but you have to be stable and the boys were always stable and really fluent offensively. "It is a good example of how football should look. Let's try to do it again and again." The victory ensured Liverpool kept a point ahead of Manchester City heading into the final 10 Premier League matches of the season while also cutting their rivals' superior goal difference down to six. But Klopp maintained his mantra of focusing on his own side and not concerning himself with what Pep Guardiola's team are doing. "I don't think you need an answer from me," he said when asked about the title race. "We only need to play football and to win games then we will see what happens. "It's not like I go in the dressing room and someone tells me the (City) result and I get a heart attack. "It's a normal thing. If you are top of the table, it's pretty likely that all the contenders win. That's how it is. "That's the only advantage you have when you are fighting to stay in the lead because the other teams lose a bit more often than our fight. "I didn't think about City but it is of course what I expected." The manner of Watford's defeat was surprising as they came into the came inn decent form with six victories and four draws in their last 11 matches. Manager Javi Gracia, however, tried to see past their Anfield mauling. "The only thing I can say about my players is that I have big confidence in them," he said. "We are keeping a good level in all our performances. We knew it would be tough but we will look to the next game."